Now the Libelle Epic Ivory Swirl is only $50 at Colorado Pen! I know what you mean about agonizing. Just today, after hours and hours of searching and researching I ordered a Cross Sauvage in ivory. It's all your fault too. The only regret I have about my purchase is that the UPS trucks no longer make that wonderful roaring sound as they come down the street. That was always the official and exciting conclusion to any online purchase. Though the excitement of receiving orders is somewhat diminished, I undoubtedly will enjoy my new pen regardless. 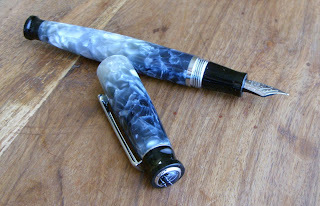 BTW, your picture of Winter Storm shows a more beautiful pen than do the pictures on the pen sites I agonized through. I'm partial to blue but even the grey of the other pictures presented me with temptation. If only Libelle offered a fine point nib.... But then again, maybe I need another medium point in my collection! You are right. The pen looks much more grey in real life.